US rate hike fears subdue markets. After clocking 1 per cent in its previous session, the stock markets fell owing to selling pressure on Tuesday with banks, capital goods, metals and auto stocks reported profit booking. Mumbai: After clocking 1 per cent in its previous session, the stock markets fell owing to selling pressure on Tuesday with banks, capital goods, metals and auto stocks reported profit booking. Along with global markets, even Indian markets continued to be rangebound as US Fed two-day policy meet to begin in September 16. Till then the volatility would continue, says experts. 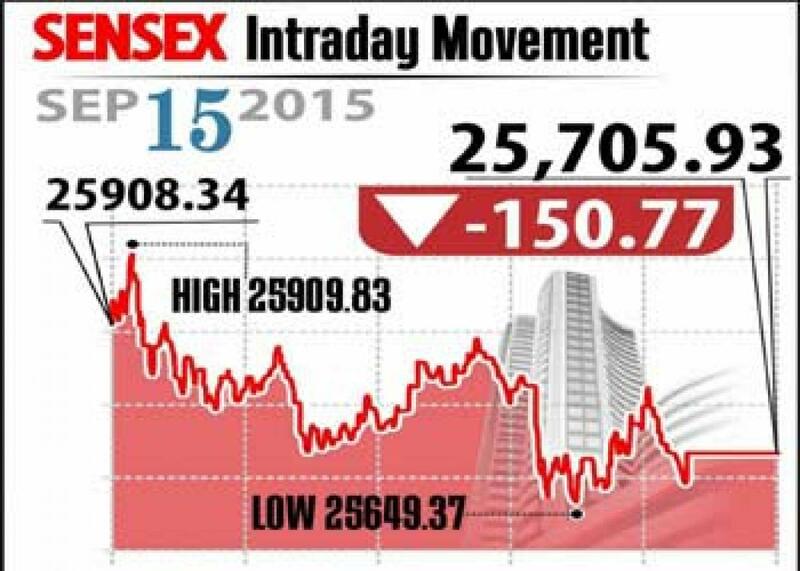 Sensex closed lower 150 points at 25,705 and Nifty down 43 points to end at 7,829. Also broader markets closed weak on par with heavyweight stocks, as midcap and smallcap indices fell about 1 per cent each. On the sectoral front, metals and capital goods indices declined over 2 per cent followed by other sectors like consumer durables, auto, banks and realty, all fell up to 2 per cent. However, FMCG index gained around 0.4 per cent. Following media reports that Sun Pharma is in verge of acquiring US based InSite Vision Inc, the company shares gained up to 1 per cent. With the easing of consumer price inflation in August, the FMCG stock like ITC and HUL gained about 1 per cent. After profit booking, the banking stock witnessed gains with Axis Bank, HDFC, HDFC Bank and ICICI Bank fell up to 2 per cent each. As the government allowed foreign investors to invest in Maruti SuZuki India, the company's shares gained over 0.5 per cent. The gainers: Hindustan Unilever, up 1.15 per cent at Rs 804.75; Sun Pharma, up 1.11 per cent at Rs 866.70; ITC, up 1.09 per cent at Rs 316.75; NTPC, up 0.68 per cent at Rs 126.40; and Reliance Industries, up 0.52 per cent at Rs 867.55. The losers: Tata Steel, down 5.08 per cent at Rs 229.05; Vedanta, down 4.06 per cent at Rs 96.90; Tata Motors, down 3.69 per cent at Rs 333.95; Hindalco Industries, down 3.05 per cent at Rs 76.30; and Larsen and Toubro (L&T), down 2.92 per cent at Rs 1,556.95.